Have you found yourself any great bargains in the sales recently? there are so many brands on sale at the moment. Or do you find all that sale stuff a bit wintry ? This is the Patrice Faux Leather Skirt from their AW15 collection. I loved it as soon as I saw it, thinking about the leather biker jacket I already had. The skirt is very good quality, and you wouldn’t know it isn’t leather The biker jacket is from next, bought in a sale two years ago….. But what I’m getting at here is I normally buy something High end retail in the sales even if it wont be worn until it’s hot or cold enough to wear. This is when to buy your labels that you cant always afford (well I cant !) I look for classic items that can be added to my wardrobe and worn till the cows come home. Ok this skirt wasn’t overly expensive, but to me it was still a great bargain find. I also bought another skirt on my shopping trip that was reduced to £20.00 from £199.00 ! I will be posting about that beauty of a bargain later…….. So What else to look for in in the sales? Shoes – A high end designer court shoe is never going to date. A blazer – A good quality blazer for when the weather gets a little warmer. What are your favourite sale finds?I would love to hear from you….. I'm a sucker for a great deal (and this one tops the cake)!! I'm one of those terrible people that go to the sales rack first —and if it's a great deal buy it and then figure out what I'm going to wear with it! But I've learned to buy non-sale items too—it's all a balance, right? Your skirt is such a perfect neutral—you'll get so many wears out of it, I bet! I always keep my eye on end of season sales as you can pick up some great bargains and a leather skirt like this will never date. A savvy buy! Ahh this is something I always set out to do yet never accomplish because I forget. I forget to shop for pieces I want during off season. Such an idiot, I know. Unlike you. Lucky you. That skirt is STUNNING. Thank you Sheela. You always look stunning anyway ! I find it very practical and wise to shop classics during sales. I adore the warm color of the skirt and the 70s style it allures to, being versatile in the same time. 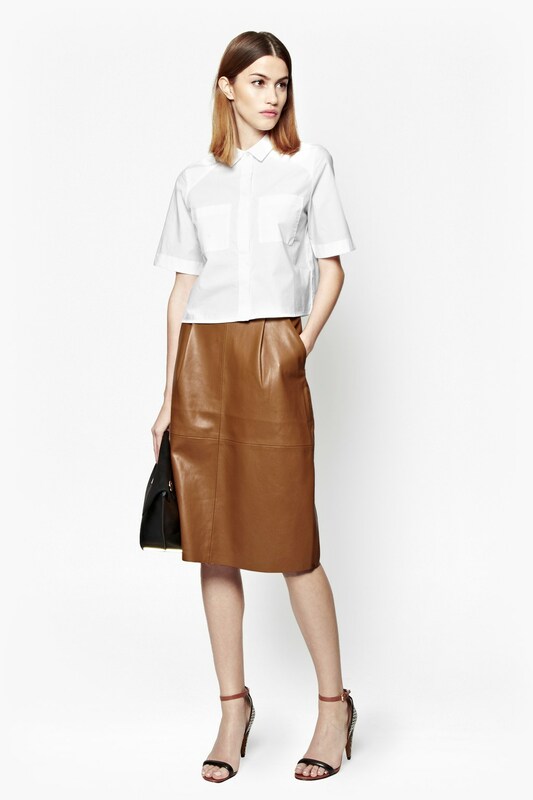 Beautiful transition look and such a great buy on this leather skirt! It really looks fab with your boots and cream top. I do enjoy buying classic pieces when they are bargains and holding on to them for the next season. Thanks for linking up to Top of the World Style. I agree you get the best deals for the classics when you buy off season. I find most of my bargains at this time Nicole ! That's a good list of things to buy when on sale. I tend to spend more money of items that I know will be kept season after season like a blazer or a pair of shoes. Beautiful skirt. Enjoyed visiting your blog from "Between the Lines." This is lovely Laurie, I've not been shopping in ages!! Hi Laurie, This is exactly what I do! The only way I could afford my leather biker jacket and I keep an eye on the sales. Last year I bought Karen Millen jeans, a Radley bag and some lovely Hobbs bits in the sales. Like you, I mix and match in with things like F&F basic t-shirts (£4 and perfectly good quality!) to make it work. That is a lovely classic skirt and the whole outfit is timeless and chic. Beautiful! You look great and perfect timing as I am going into winter where I live. I'm Sue from sizzlingtowardssixty.com.au and I'm also participating in the Between the lines series. Looking forward to getting to know you. Have a great week. Nice to meet you through Between the Lines! Gorgeous outfit and skirt!